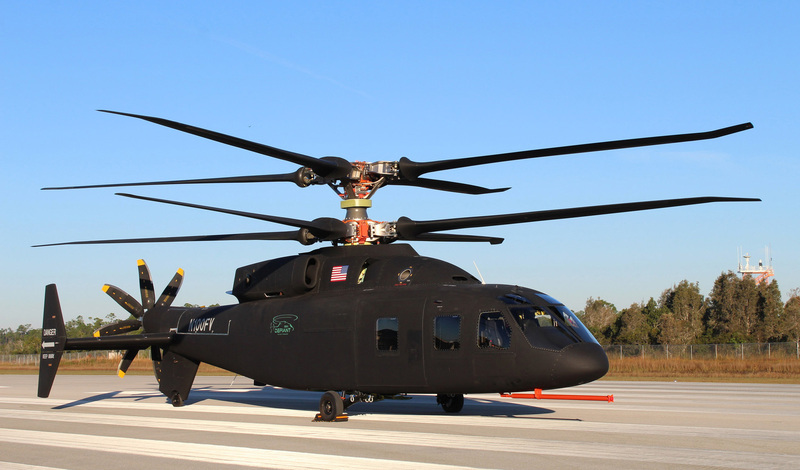 Sikorsky, a Lockheed Martin company, and Boeing provided the first look at the SB>1 Defiant helicopter the companies have developed for the U.S. Army's Joint Multi-Role technology demonstrator program. The SB>1 Defiant is designed to fly at twice the speed and range of today's conventional helicopters and offers advanced agility and maneuverability. The main rotor technology has been in use over 40 years by Kamov, The push rotors ads a lot of structure, costs and ... speed. We are trying to create a dedicated helicopter VTOL forum for topics like this. Take a few second to support. Thnx! That may just be why Airbus went the one rotor, two props route. The 2nd prop probably adds less weight than a 2nd main rotor. The V280 just appears to be a much more elegant/lighter package than this, to me. It will be interesting to see how these ‘tech demonstrator’ aircraft evolve next. I also would like to catch a glimpse of what Boeing is touting as a ‘compound conversion’ for the AH-64’s. That sounds, well, interesting. I think AVX is still intent on competing, somehow, for a portion of the future procurement programs, and I’m partial to their designs/philosophy, but it would be great to see prototypes/actual aircraft being built. The Defiant looks 'bulky' yet has a small fuselage.... It doesn't look quite 'right' to me with such a tall rotor mast. I am very interested In how the V-280 and the SB>1 compare. Wouldn't counter-rotating main props add quite a bit of speed even without a pusher by letting you run them at higher rpm without trailing edge stall being as much of a limit? If this design gets selected it is a major step backwards. There are so many advnantages with a tilt rotor with very few disadvantages. During cruise you gain efficiency by using wings to produce lift. Much less thrust is then required to move it forward. The SB1 still requires lift to be provided by the props which burns lots of fuel. It could never reach the top speed of a tilt rotor. Tilt rotors can also do rolling takeoffs to increase payload/range. The only downside to the tilt rotor is it requires a slightly higher thrust when hovering. This is due to the smaller rotor area giving a higher disc loading. It requires more power to push the same volume of air. It could also be that the service is more interested in hovering and getting to the ground and back in the air faster than you can with a tilt rotor. A traditional helicopter is more agile up and down than tiltrotor. The tiltrotors main advantage is in cruise, but a high cruise is not necessarily preferable to the agility on all missions. One other disadvantage based on feedback from the Middle East is the V-22, and you would expect other tilt-rotors, also have a higher incidence of brown out. The USMC have done a lot to overcome it and hopefully the next 30 years of US Military ops aren't in sandy locations but it would be a factor to consider. i see the benefits of both approaches to the requirements and appreciate RJMAZ and Ozair's opinions above. It will be fascinating to watch how this competition goes. Agree here. For example I would expect this configuration to lift more in a sling type situation. Overall for aircraft that are supposed to be helicopters and work vertically I like this design better. There is always this "debate" that pops back up as if tiltrotor and compound where an either/or situation. This is not a zero sum competition, although it is being framed as one. There is a case for having both a tiltrotor and a compound helicopter in the future, and this is very likely the path the Army and other services will take. Tiltrotors are great for speed but lack in nimbleness, while compound helicopters are good (not great) for speed and excellent for nimbleness. Tiltrotor hovering is less than ideal, as seen on the CV-22 and MV-22, and this limitation is simple physics, it can be mitigated but not entirely. Tiltrotors will be excellent at supporting longer range raids and logistics to FOBs including troop transfers, but not for most applied combat missions in any reasonable theater size. The attack platforms which will replace the Apache and Cobra/Viper down the road will almost certainly be compound and not tiltrotor because they need to be extremely nimble, quick up and down, turn on a dime, etc, which a tiltrotor cannot do well, especially not in hot, high, and sandy/dusty places. Utility platforms at a tactical level, including medevac/CSAR, will also probably have to be compound or conventional as well, for the same reasons of nimbleness. One of the reasons the Air Force rejected using the CV-22 as a primary CSAR platform is that although it is fast, which gets troops on target very quickly, once it gets on target it is much more of a "pig" so to speak. Massive downwash on rappelling, guaranteed brownout in dusty places, enormous LZ required to land or hover, and basically can't operate over rooftops or in constrained valleys and canyons, the list goes on and on. AFSOC Osprey operations continue, because it is useful to get people far and quick, but it's messy and some would say dangerous. The V-280 will obviously be a major improvement on the V-22 but the basic limitations of tiltrotors will still be an issue going forward. That is one of the best posts I have seen in some time.... agree, well done and cheers! Pick both, spread the wealth, problem solved. That allows the machine that is best for the task to be used. Novel Concept! I think they should do both, there are enough needed to cover the R&D of each. Then, there is also some bidding incentive, the best price but also performance can be judged. The total orders could be divided into 1/3 rd chuncks - tilt 1/3, compound 1/3, and the best bird could take as much as 1/3, or closer to balanced if both are good machines. The V-22 as the ‘prototypical’ tiltrotor isn’t fair to the platform though, as it had to be designed with rotors limited to lengths allowing it to be stored on ships, folded. Any sane design today wouldn’t rotate the engines, only the nacelles, and would also have much larger diameter rotors. This decreases brown out and vortex ring state alike, dramatically. The USN and Marines insisted the V-22 fit aboard carriers, of course. Almost no USN aircraft are ever good at other missions/environments, because they’re absurdly limited to basically 1960’s (or before) conceptions of naval warfare. The F-35 is the exception based essentially on the fact that it’s got billions rolled into it’s software/communications/electronics suite for other variants. Look at how many times up until now the different branches have demanded different machines and got them. Why not have one service demand heli's machines for different missions the same way there are different airplanes for different missions. Just such a dated looking hull. Kinda reminds me of a Aloutte III. Or Aloutte III crossed with a UH-60. I am concerned with the pusher-prop configuration, for a few 'real-world/practical' reasons. The prop-arc is technically protected by the inverted vertical stabilizer with 'tail wheel'... but on 'improvised LZs', with debris is everywhere, and/or on sloping/uneven terrain... this seem like a FOD/strike hazard. Also, IF a pusher-prop strike occurs... due to LZ FOD/terrain-impact or crash-impact or battle-damage or whatever... then the damaged blades become flailing and/or unconstrained vibration hazards... unless the pusher-prop can become disengaged from the power-drive system so that it could quickly stop/shut-down totally for safety. IF the pusher is shutdown for any reason, could the acft to fly safely with just the main rotor system? Anyone remember the Lockheed AH-54 Cheyenne? The much smaller/simpler, more reliable, less expensive readily produced AH-1[G] Cobra won the day in Vietnam. Cheyenne production was delayed due-to a myriad of technical, operational and practical issues... so-much-so that it killed itself-off. Likewise... the RAH-66 Comanche HELO also died a slow death due to technical, developmental, operational and practical issues... although now that I re-see it... there is some stealth helicopter technology that probably carried bleed-thru to the 'stealth Blackhawk'. The counter rotating base helicopter should be fully functional, albeit not as fast. What may be an issue is the tail and prop that do not allow any "lean back" in the landing phase. attitude must be level while still at some height to not drag the tail and prop into the ground. Yes, the aircraft can fly perfectly well without the pusher prop, but with a reduced max speed. As to the pitch attitude at landing, with the prop stopped it will behave just like any other helicopter. If instead the prop is spinning, then the prop acts as an additional control. At least in principle, by playing with the main rotor longitudinal cyclic and the pusher prop collective, you can hover and land at a wide range of pitch attitudes, nose up, nose down, flat. On the contrary, the prop allows it to perform incredible maneuvers and stop much quicker. I believe the blades have full pitch authority at any speed - I saw some demos (maybe animations or the demonstrator?) where it could nose-up / nose-down and use the pusher fan to hold it in position! Likewise it can reverse the tail thrust and come to an immediate stop without "lean back" as you say. There's no ADVANTAGE to doing that type of landing, it's just the only way a conventional helicopter can reduce speed. I expect them to employ the pusher fan in some really creative ways for maneuvering and speed-change performance. With two rotors they produce lift at any speed (and drag). With one rotor you need wings to produce lift at high speed, because your receding blades are slower than the helicopter. So in reality these are two completely different designs. Airbus is not designing a military helicopter but a commercial one that they need to sell at a reasonable price, that must play a role, too. Yes, but you get them for "free"" with the engine mounting stubs. If it is a good idea on a military helicopter that is, is however in deed a different story.